Chang Wufei, the Solitary Dragon. The angst-ridden Chinese boy that fights not only to end the war but for a cause too personal to discuss, to share. The calm and reluctance to accept help earns Wufei the barriers that he needs to distance himself from others but the passion for the deliverance of Justice and honor cannot be helped but admired. 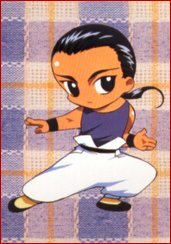 Born into a fairly high-class family on L5, Wufei was reared in the scholarly way of strengthening the mind and body and was thus brought up with a knowledge of honor and martial arts, although taking no interest in the war that was waging around him. However after an arranged marriage at a young age, Wufei was against his wishes drawn into the war by the actions of his young wife. Possessing a strong sense of justice and honor, Nataku - or Meiran - couldn't stand by and watch while others were killed by war. This and more often made her at odds with Wufei's scholary nature. After a very short period of time together, in which the couple did actually learn to like each other, Meiran was killed while protecting her colony. 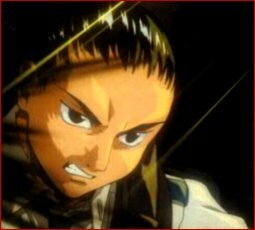 Thus to be worthy of her as a husband, Wufei adopted all her ideals for honor and justice and with the help of Doctor O, became the ace pilot of the Gundam Shenlong, whom he named 'Nataku'. Wufei, probably possessing the calmest outlook in times of trauma that some wonder if he is affected by them at all. The disdainful mask that Wufei keeps up is not only to keep others at bay, but to keep to himself the secret cause that he is fighting for thus preferring solitude to anything else. Withdrawn and quiet but calculating, Wufei has high expectations for himself and is evidently skeptical of the women who call themselves warriors, calling them weak and emotional. However with the relationship between himself and Sally Po, Wufei was able to see that strength not only comes from the outside but also from the heart. Wufei also shows a righteous sense of protectiveness and caring with the time that he saved an unarmed Sally from a mobile suit. Wufei's most distinctive features: the ranting about honor and Justice, the word 'kisama' that seems erupt out of his mouth so very often ^^; and the very tight pony tail that seems so painful on the scalp ^_^.